A new plugin that allows to convert a 2D vector layer (SHP format) to 3D from a DEM located at the same area has been released to be installed on gvSIG. The plugin will be available for the final gvSIG 2.5 version, but it can be downloaded now to be used on the latest final version (gvSIG 2.4). This new functionality allows to convert a 2D vector layer into a 3D layer, taking Z coordinates from a Digital Terrain Model on the same area, and assigning them as Z coordinate to the elements of the vector layer. The vector layer has to be a shapefile (it works on points, lines and polygons). To install this plugin, you must access to Tools -> Add-ons Manager menu, and select the “Install from URL” option. Connecting to the default URL, you must select the “Geoprocess” category, and you will have to mark “Set Z from raster” package. After installing it and restarting gvSIG, the geoprocess will appear in the Toolbox (Tools->Geoprocessing menu), in the Scripting->Transform section. 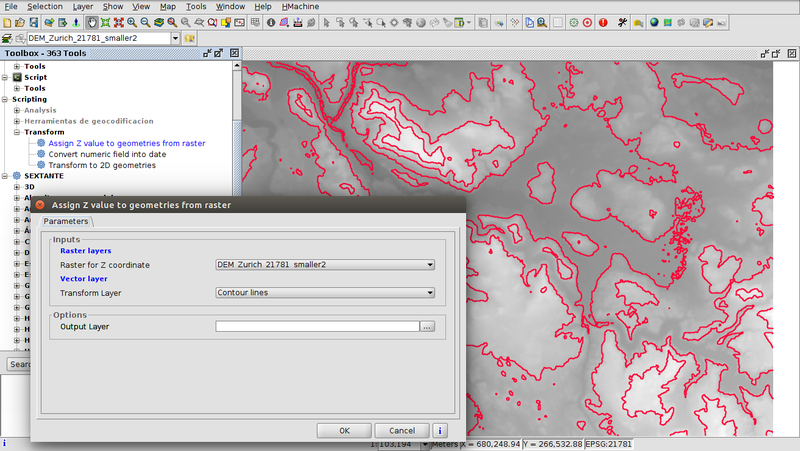 To run this new geoprocess you only need to insert the 2D vector layer and the raster layer as parameters. This entry was posted in english, gvSIG Desktop, scripting and tagged 2D to 3D, DEM, Digital Elevation Model, Geoprocessing, scripting. Bookmark the permalink.